Field that stores values in a 2D-matrix table in a page. This module is useful if you wish to save data in a 2D-matrix(grid) table.The matrix table is made up of row and column headers of pages whose individual intersections form the 'matrix values'. 1. Use a valid ProcessWire selector. Here you enter valid ProcessWire selectors for finding pages to build your matrix rows and columns respectively in the relevant input fields found in your matrix field's 'Details Tab'. If you use this method, it means all instances of the field across different templates and pages will have identical rows and columns. This also means that if you wanted to create matrices with different rows and columns, you would have to create a new field for each. 2. Use custom PHP code to return row/column pages. If used, this method overrides method #1 above. This allows you to specify valid PHP code to find pages for the matrix rows and/or columns. The PHP statement has access to the $page and $pages API variables, where $page refers to the page being edited. The snippet should only return a Page or PageArray. If it returns a Page, children of that Page are used as column pages. 3. Specify a Multiplepage field for row/column parent pages selections. If used, this method overrides method #1 and #2 above. The method allows you to reuse the same matrix field to create matrix tables made up of different rows and columns on a page by page basis. To use the method, you first specify the name (e.g. product_select) of a valid Multiplepage field that will hold the parent pages of both your rows and columns pages.Make sure to first add that Multiplepage field (product_select) to the template(s) of the page(s) where you will be building your matrices.Go and edit your matrix page. No matrix will be shown until you first select 2 pages in your page_select and save the page.The first page selected will be assumed to be your matrix rows pages parent and the second one your columns pages parent. Any additional selected pages will be ignored. If either of the parent pages you selected does not have children, you will get an error. If available, the children of the selected row/column pages respectively will be used to build your matrix table. Please note that if you changed or reordered the pages in your product_select page field and saved the page, a new matrix will be built using the children of the newly specified row and column pages and ALL your old values for the specific page you are editing will be deleted in the database. By using this method, if you've properly configured your product_select, you can build a large variety of matrix tables on a page by page basis as long as those pages are using a template with the product_select page field. FieldtypeMatrix stores row and column pages data as their respective page->id. Matrix-values store any data (varchar(255)). A matrix table of clothes' colours (rows) vs their sizes (columns) and the price (value) for each combination. Car types (rows) vs engine size (columns) and their warranty (value). Gender (rows) vs Age (columns) and their favourite movie for each combination. See more examples in the support forum. The module allows the creation of matrix tables of any sizes (rows x columns).The rows and columns dynamically grow/shrink depending on the addition of row/column pages that match what you set in the matrix field's settings in the Field's 'Details Tab'. Currently, if such pages are deleted/trashed/hidden/unpublished, their data (and presence) in the matrix are also deleted. In admin: Modules > Check for new modules. Install Fieldtype > Matrix. Create a new field of type Matrix, and name it whatever you wouldlike. In our examples we named it simply "matrix". The module provides a default rendering capability as well, so thatyou can also do this (below) and get a similar result as the first example above (without the captions). Other more complex queries are possible, e.g. find all products that are either red or purple in colour, come in x-large size and are priced less than $50. ###Version 1.0.4Added import modes for file/copy-pasted CSV, 'append' and 'overwrite'. Added option to ignore first row and/or column for imported CSV data. Added ability to export only selected rows. Added ability to use shift+click to select a range of rows. ###Version 1.0.3Export matrix to CSV. Optional configurable alert message to show after clicking 'clear data button'. Added option to save empty values. Added option to show matrix row numbers. Added checkboxes for row selections. Clear data button only clears data of selected rows. ###Version 1.0.2Add in-memory method getValue() to get the value at the given coordinates (row,column). E.g. getValue(row, column). Row/Column arguments can be ID, path, title or Page object. ###Version 1.0.1Added ability to specify column/row pages using custom PHP code. Configurable browser warning for matrix table reset button. Added two in-memory properties rowLabel and columnLabel to return 'user-friendly' row/column names (e.g. echo $matrix->rowLabel to render 'red', 'small', etc.). Added two methods getRow() and getColumn() (in-memory) to search and get a single matrix row/column by path, title, ID or Page object. ###Version 1.0.0Changed version to 1. Changed status to stable. ###Version 0.0.9Fixed a character encoding issue regarding fopen. ###Version 0.0.8Option to populate matrix table via a .csv/.txt file upload. Top and Bottom Reset buttons to clear all matrix values before save. Changed development status to Beta. ###Version 0.0.7Added optional feature enabling fast import of CSV data using MySQL's LOAD DATA INFILE. 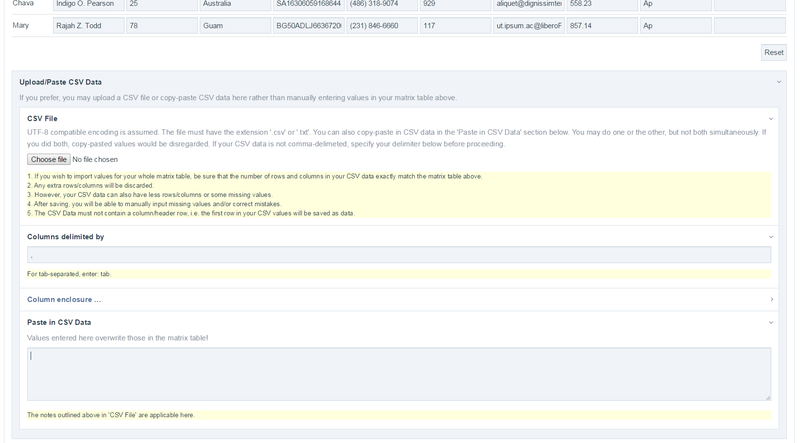 ###Version 0.0.6Added ability to copy-paste CSV values to populate the matrix of the current page. ###Version 0.0.5Further code cleanup and split some code into two methods. ###Version 0.0.4Code optimisations, cosmetic cleanups. ###Version 0.0.3Corrected oversight whereby records with empty values were being saved to the database. ###Version 0.0.2Added feature to select matrix row and column parent pages via a named Multiplepage Field select present on the page containing a matrix table.